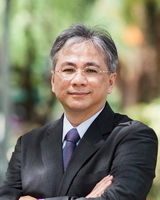 Tao-ming Cheng has received his Ph.D. in 1996 from the School of Civil Engineering, Purdue University. He became a faculty member of the Department of Construction Engineering, Chaoyang University of Technology (CYUT), Taiwan from 1996. He was promoted as a full professor by CYUT in 2007. He has been the Head of the Department of CE, Acting Dean of the College of Science and Engineering, Dean of Academic Affairs. and the Vice President. He is now the President of CYUT. Professor Cheng's major is in the area of construction engineering and management. His research interests include simulation of construction operations, construction productivity optimization, and ergonomic studies on construction operations. He has been awarded outstanding teaching by CYUT in 2000 and Who's Who in the World by Marquis in 2012. He is the reviewer for Transactions on Evolutionary Computation (IEEE), Transactions on Evolutionary Computation(IEEE), International Journal of Production Economics, Automation in Construction, Simulation Modeling Practice and Theory, Computing in Civil Engineering (ASCE), Journal of the Chinese Institute of Civil and Hydraulic Engineering, Journal of Marine Science and Technology, Built Environment Project and Asset Management, Journal of the Chinese Institute of Engineers, Journal of Performance of Constructed Facilities(ASCE), and International Journal of Applied Science and Engineering.